This week as I travel through the UK I am skimping through the papers over smoko between drives, the Brexit is a massive topic here and accordingly the UK market is susceptible to rumours and worry. This week it appears Boris Johnson, the former Mayor of London and former Foreign secretary may be plotting to unseat the current Prime Minister. Strange goings on here, that would never happen in Australia..!! What are Aussie’s up to now, 7 prime ministers in 10 years? Check out the XJO chart to see our thoughts on that one. 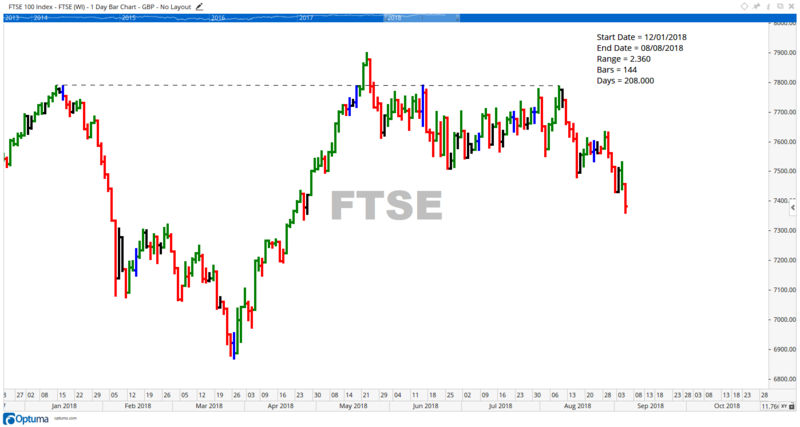 But back to the FTSE, it made a major peak Jan 12 and then, a trading event like I have seen for decades, 144 trading days later on Wed August 8 the FTSE makes a major peak and starts to decline. If I have seen it once I have seen it a thousand times, the 144 count has to be watched closely for signals of weakness. And, forming a triple top under a high, can only be considered as a weak signal. I hope this helps you to understand the significance of some numbers in trading, and in particular the number 144, Gann’s favourite number in trading.